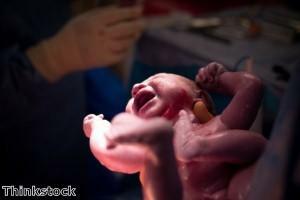 Caesarean section delivery may have an adverse effect on the developing immune system. Children born by Caesarean section may experience slower immune system development and an increased risk of allergies in the future, scientists have found. Researchers in Sweden and at the University of Glasgow in Scotland studied 24 children from birth to two years of age to see whether there was any link between the way they were born and the diversity of microbiota in their intestines. They discovered that Caesarean section delivery was associated with reduced gut microbiota diversity during the first two years of life, compared with natural birth. One group of bacteria that were affected are called Bacteroidetes; they have previously been shown to help protect against allergies. According to the researchers children born via Caesarean section may therefore have an increased risk of allergies, as well as of conditions such as diabetes and irritable bowel syndrome. It is thought that the journey along the birth canal during a natural delivery exposes babies to bacteria, thereby kickstarting the formation of microbiota in the children's own intestines. This in turn is thought to be vital for the development of the immune system during the first few years of life. Professor Maria Jenmalm, from Sweden's Linkoping University, commented: "Sometimes Caesarean sections are necessary. "But it is important that both expectant mothers and doctors are aware that such a delivery may affect the child's health." The findings are published in the journal Gut and suggest that those born via Caesarean section may be at risk of lower immunity throughout childhood and beyond. One way for these people to help their immune system could be to use a food supplement such as BioBran MGN-3. Manufactured by breaking down rice bran using enzymes derived from shiitake mushrooms, this effective supplement has been shown to help the body maintain a strong and healthy immune system. It works by providing glyconutritional support to white blood cells, helping them to carry out their vital role as they travel around the body combating pathogens and abnormal cells.